Native plants are not just pretty to look at—they are also cherished for their healing properties. 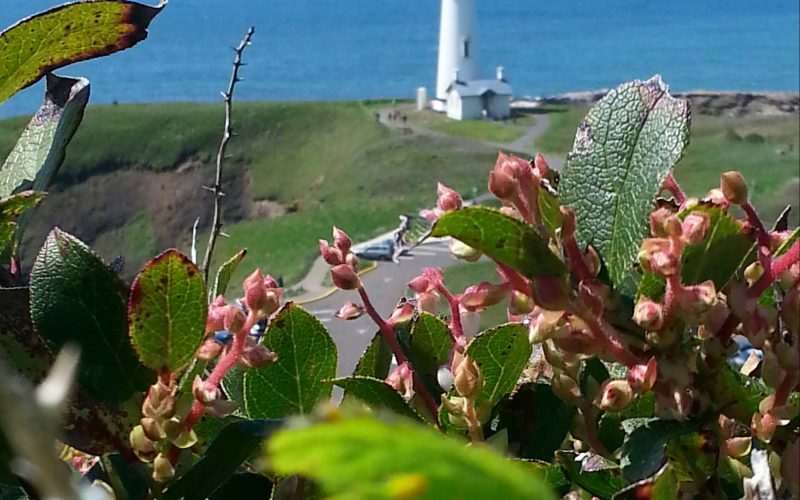 NATIVE PLANTS ARE underfoot, overhead—and often ignored—on the Oregon Coast. But they could save your life. 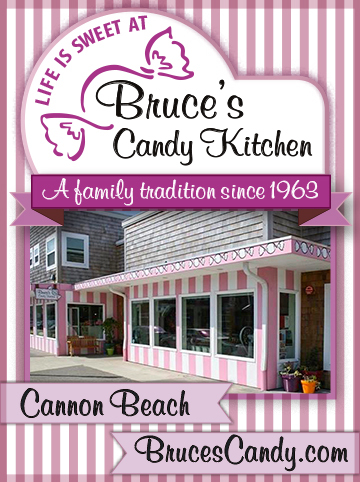 Or cure your sore throat, disinfect your scrapes, or add to a more youthful appearance. 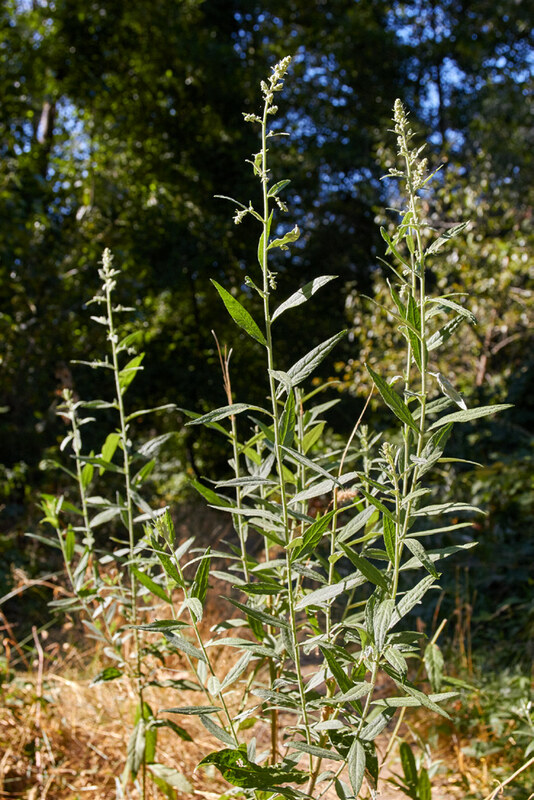 Many people don’t realize the medicinal properties in everyday coastal plants, according to Scott Kloos, a Portland herbalist who gathers native plants here. 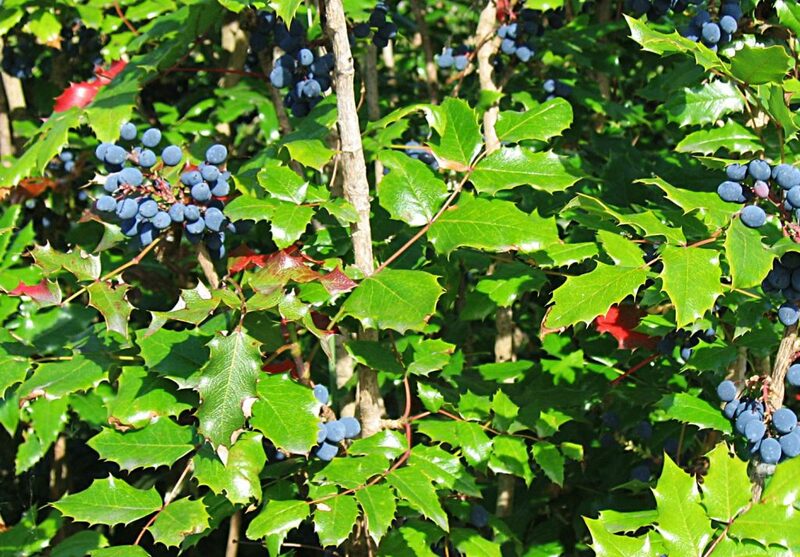 Long before Kloos discovered the magic of salal and Oregon grape, tribal people of the Coast were using native plants to heal what ailed them. 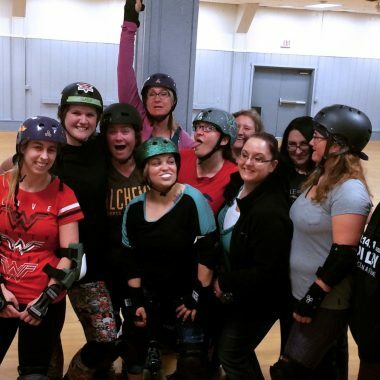 B.G. 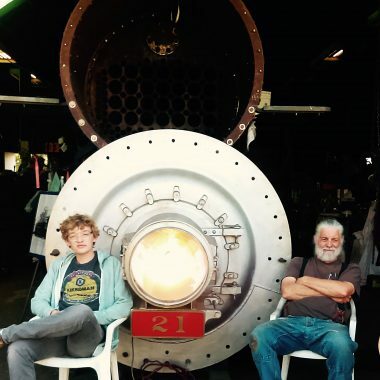 Barton of the Umpqua-Rogue River tribes in an ethnobotany workshop. 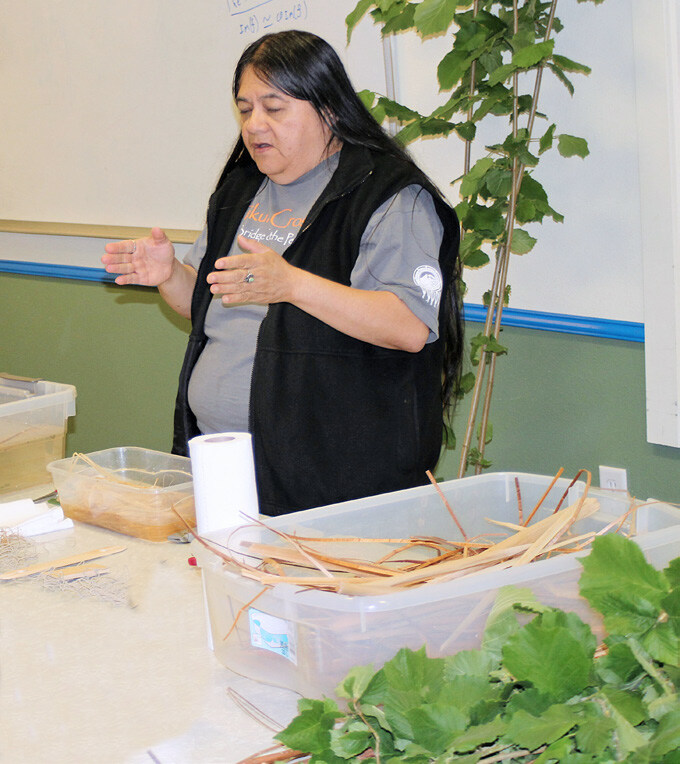 Survival of those first people depended on their knowledge of common plants, says Greg Archuleta, a member of the Grand Ronde Confederated Tribes. At a recent ethnobotany workshop, tribe members demonstrated native use of plants for food, healing, clothing, baskets, tools, shelter, and ceremonies. 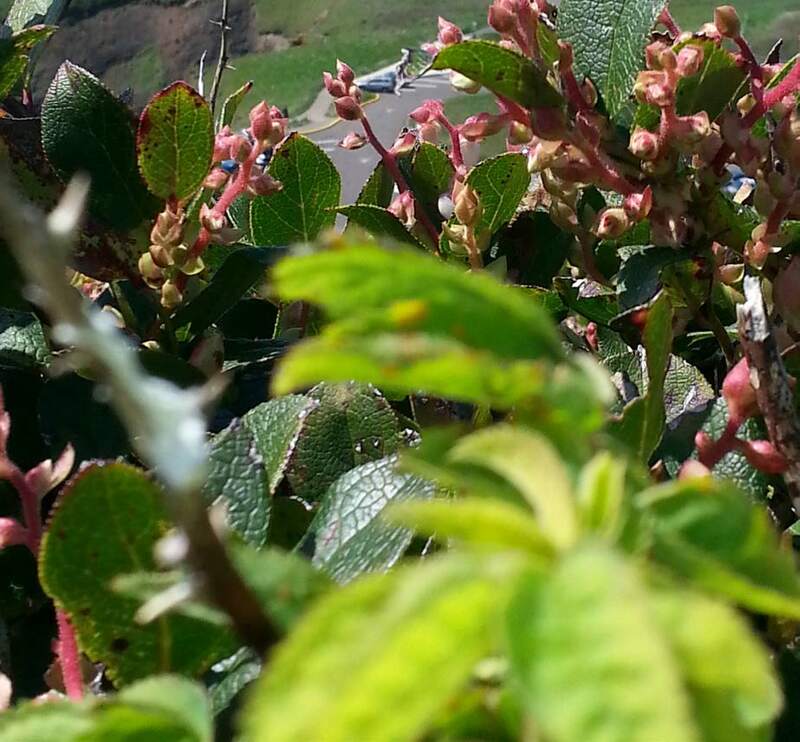 Some of the most common therapies come from plants readily available on the Oregon Coast. 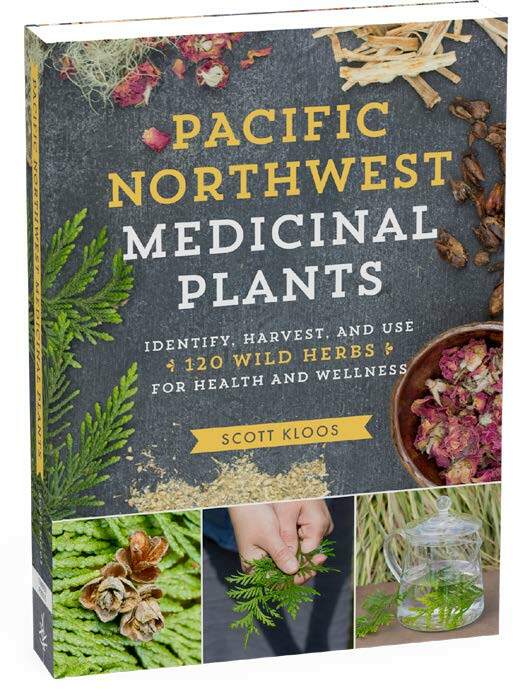 “Learn a few good plants, collect them yourself, get to know them yourself, in the true sense of the amateur,” wrote the late Michael Moore in his book, Medicinal Plants of the Pacific West. The best plants are those that you can gather from your own area, he said. Following is a short list is of a few medicinal plants found on the Oregon Coast. WHERE FOUND: Salal is common from the central California coast to the Alaska panhandle, and inland, to the Cascade mountains. 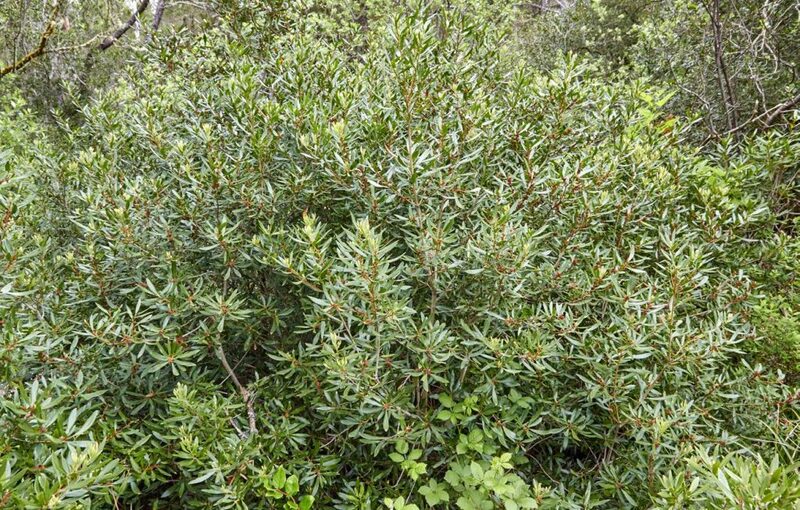 Although it can grow in roadsides, hedges, and open areas, it thrives in shady and moist understories, forming thickets. PARTS USED: Whole plant, including leaves, branches, and berries. BENEFITS CLAIMED: Flavonoids in the berries provide antioxidants for cardiovascular health. 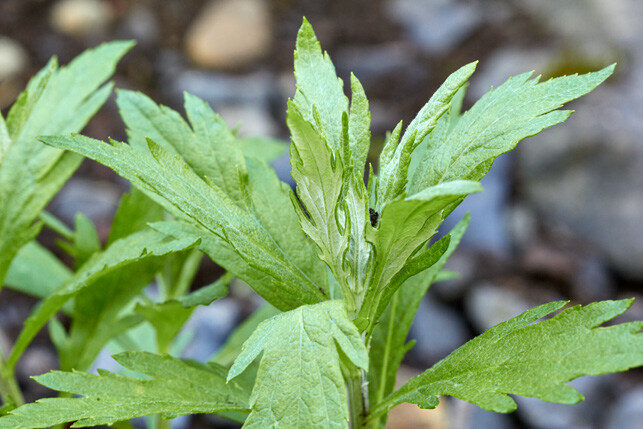 Leaves can be used in a poultice to stop bleeding and relieve pain. Salal tea can be used internally as a gargle for sore throats, or externally as a disinfectant wash.
OTHER USES: The berries’ Latin and common names (shallon and salal) are derived from the Nootka tribes’ (Vancouver Island, B.C.) name for the fruit of the plant. Coastal natives dried and stored these berries, and others, in cakes to eat in the winter. The berries are bland but nutritious. 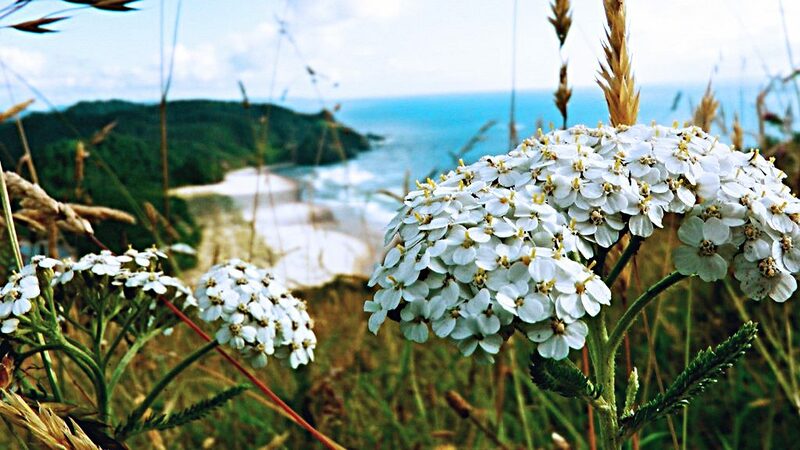 WHERE FOUND: Appropriately for Oregon’s state flower, it grows statewide, but certainly thrives on the coast. PARTS USED: The root and lower stems are used for medicine; leaves are dried and dusted on cuts as an antibacterial; the berries are edible. BENEFITS CLAIMED: Root tinctures or tea stimulate liver and skin, and act as an antimicrobial for the intestines and the skin. Skin eruptions, athlete’s foot, ringworm, salmonella, and other mild infections are aided by this liver balancer. OTHER USES: The berries—both sour and sweet—can be dried, eaten fresh, cooked in jelly, or made into wine. WHERE FOUND: This alga is found in many seas around the world, and is common in the intertidal zones of the Oregon Coast. PARTS USED: Whole plants, fresh, dried, and powdered. BENEFITS CLAIMED: High iodine content and other components make it a valuable treatment for goiter, thyroid cancer, and other benefits. A 2002 Japanese study found it also had anti-aging benefits when applied as a gel. It is sometimes found in commercial weight-loss products. 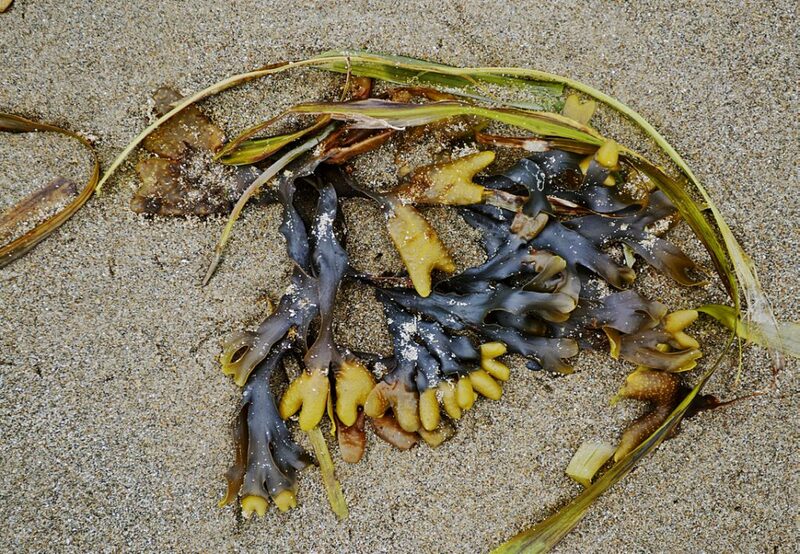 OTHER USES: Bladderwrack is often dried and added to food, such as soups. WHERE FOUND: River valleys, coastal hills, pine forests. BENEFITS CLAIMED: A mild benefit for fevers, flu, and colds. Lowers inflammation. Dried leaves or fresh-chewed plant applied externally can stop bleeding scrapes, relieve pain, and reduce infections. Take as a tea or tincture. May also be used to promote delayed menstrua-tion and relieve cramps. 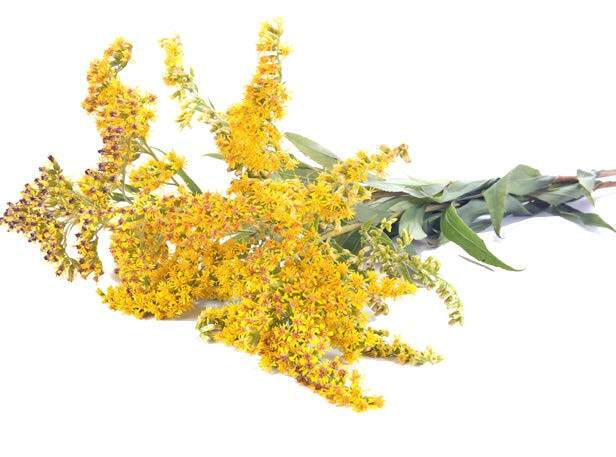 OTHER USES: The tea has been used as a hair rinse; and the steam from the simmered flowers is used to improve the complexion. 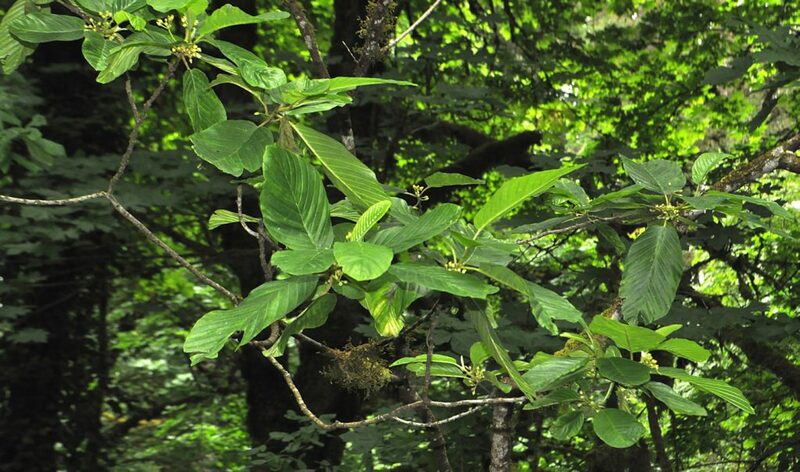 WHERE FOUND: West of the Cascades, from northern California to Alaska, in forests, often growing with alder. PARTS USED: Bark of limbs and small trunks, dried and aged for one year. BENEFITS CLAIMED: Tincture for chronic constipation, laxative. Native Americans introduced this bark to early explorers. 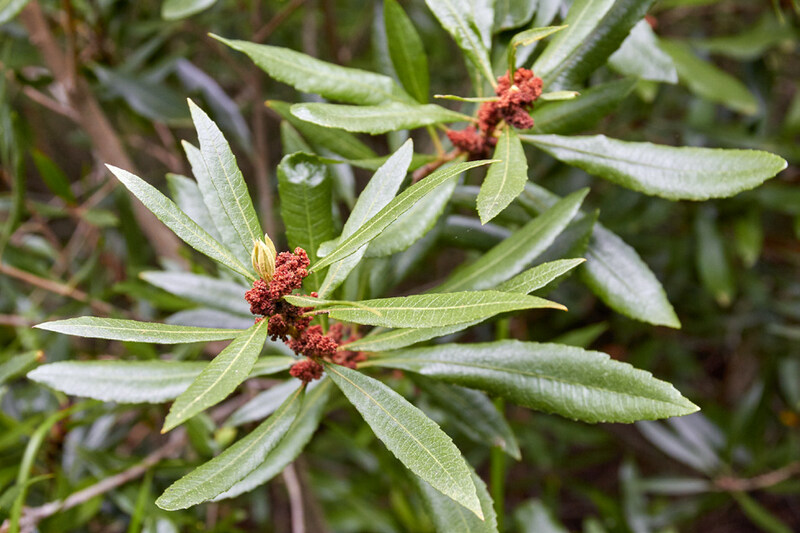 It has been used in commercial laxatives since the 1800s and is still harvested in Oregon. OTHER USES: The tree is a beautiful addition to urban and suburban landscapes, attracting birds and pollinators to its berries and flowers. 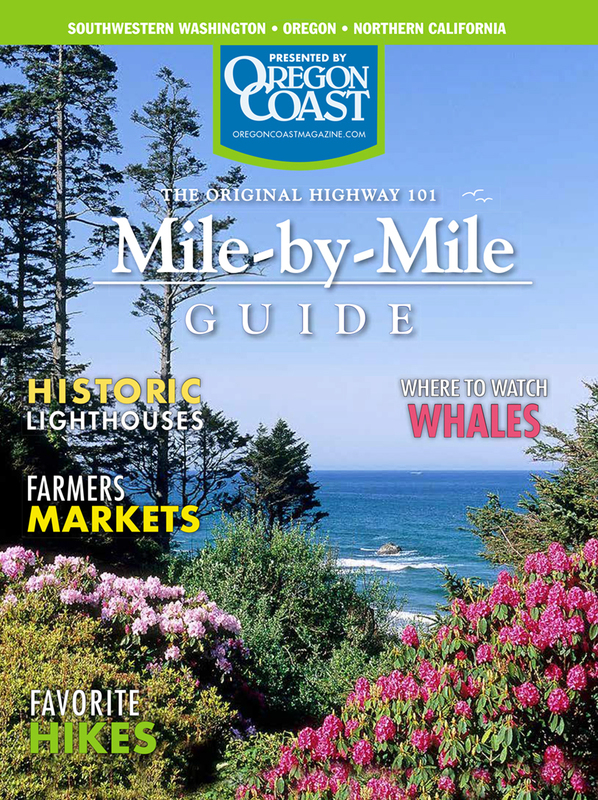 WHERE FOUND: Central Oregon Coast south to Baja California, in the moist valleys and foothills of the coast. BENEFITS CLAIMED: Reduces fever in colds and flu, aids digestion of fats and oils, reduces digestive inflammation and pain in stomach ulcers. Also, a warming menstrual stimulus. Fresh leaves have been used to reduce poison oak inflammation. OTHER USES: Native Americans used the plant in ceremonies to induce sacred dreams and to ward off evil spirits. Its Latin name refers to the goddess of the moon and dreaming, Artemis. WHERE FOUND: Grows only on the coast, usually within sight of the ocean or within the fog zone. PARTS USED: Leaves, bark, and roots. BENEFITS CLAIMED: The astringent tannins and resins in tinctures treat inflamed gums; a gargle for sore throats; tea for viral colds, sinus congestion and allergies; stimulates mucus. 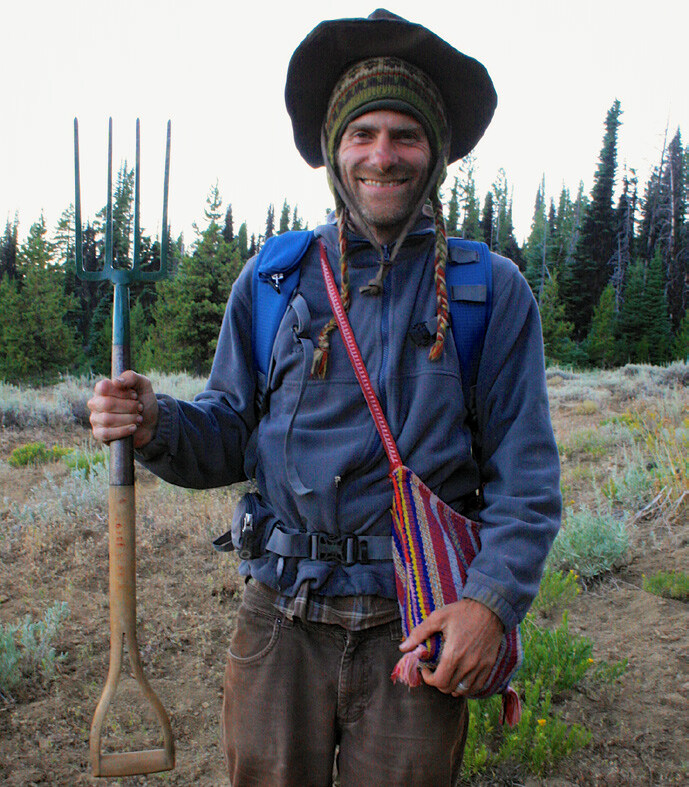 Scott Kloos in harvesting gear. Ethnobotany of Western Washington, Erna Gunther, Barnes & Nobel, 1973.